Sutri is a village of 6,000 inhabitants about 30 km from Viterbo, famous for its marvellous archaeological site on the hill opposite the town. 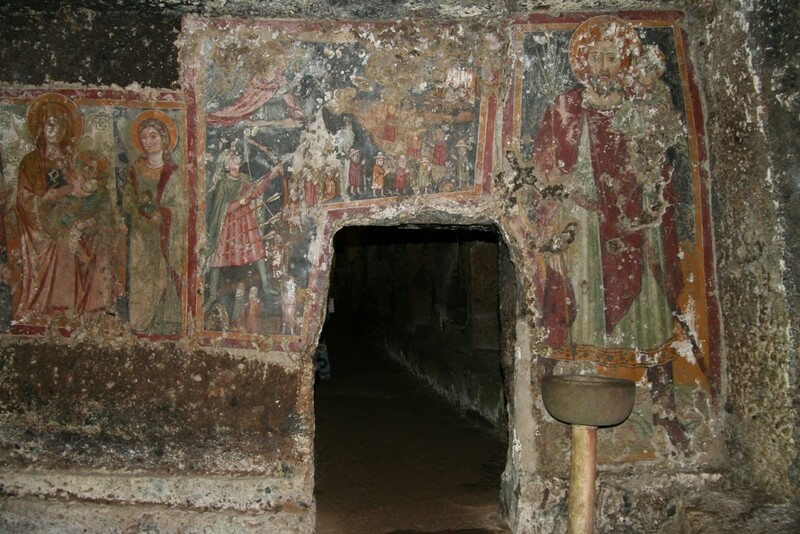 Here you’ll find an Etruscan rock-cut necropolis, a Roman amphitheatre (dating to the Augustan era, though it was long thought to be Etruscan) and a fine mithraeum, that is, a temple to the god Mithra, completely hewn from the tuff and later converted for Christian worship as the church of the Madonna del Parto. Sutri can claim a truly rich history: it was an essential destination for pilgrims, even famous ones. Suffice it to say that it was described by Petrarch; the emperor Charlemagne stopped there (and also gave it to his disinherited sister, who, according to legend, gave birth to the paladin Roland in a nearby grotto); and by 728 the Lombard king Liutprand had given it to Pope Gregory II, a move that set the foundations for the rise of the Papal State.